Trijicon RX06 Reflex 12.9 MOA Amber Triangle Advanced Combat Sight FREE SHIPPING! 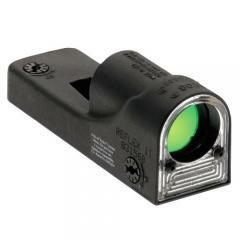 Trijicon REFLEX DUAL-ILLUMINATED ADVANCED-COMBAT REFLEX SIGHT. The new standard for instant any-light shooting accuracy. Trijicon's enhanced Reflex II is the natural evolution in speed-with-precision shooting and true-color target acquisition. The trijicon Reflex gives you maximum accuracy and true-to-life targeting, instantly, without failure-prone batteries. ©2002-2019 CopsPlus.com: Trijicon RX06 Reflex 12.9 MOA Amber Triangle Advanced Combat Sight FREE SHIPPING!